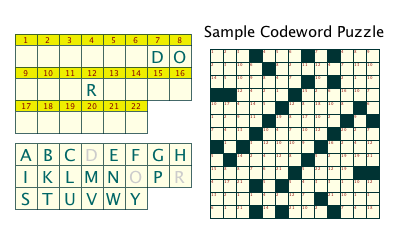 Each letter which appears in a Codeword puzzle is associated with a unique code number, and these numbers are displayed in the puzzle grid. To solve such a puzzle you must determine which letter is associated with each code. The solution process is aided by a code table which consists of a number of cells with each cell containing one code number, plus space to enter the solution letter for that code. Three of these cells will contain a letter to get you started. 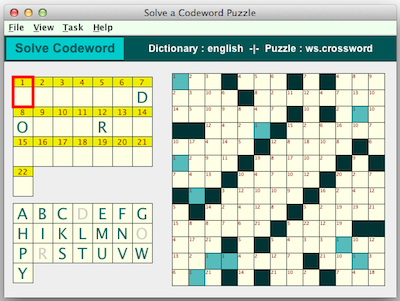 Any crossword puzzle created by Crossword Express can be processed by the Codeword solve function. The solve function contains buttons to allow you to Reveal Errors, Reveal One letter, Reveal Solution, and Start Again. Individual cells which have been treated using the Colorize Puzzle function of the Crossword Construction screen will be colorized when they are printed if you select the Print with Color print Option.